If you dream of competing in college as a scholarship athlete, your dreams begin at the NCAA (or NAIA) Initial Eligibility Center. Author's Note: Almost four years ago, I co-authored a college recruiting series with Jay Johnson. Since that time, I've had numerous requests to update and expand the series. Due to the complications inherent in doing a cooperative series of articles, I'm flying solo this time around. As a former NCAA DI recruiting coordinator, Jay Johnson still has many insightful things to say about this process, but the calendar of publication is much easier when you are making it fit one person's schedule, and not two. There will be points in this series where I rely heavily on what I learned from Jay Johnson in doing the previous series, and I'll try to give Jay the credit where the ideas expressed are more his than mine. That said, this series will break some new ground that the former series did not. If there was nothing new here, it would not be worth the effort. Rather, it would be easier for all concerned to simply republish the original series. For those interested, I'm providing here a link to the first article in the original series (which, in turn, links to all of the other articles in the series). And, by the way, Jay Johnson is still very much in circulation. He runs his own web site (devoted mostly to topics in coaching distance runners). It's costs real money--just not very much (NCAA - $70, NAIA - $65)--to register with either of the initial eligibility centers. Fee waiver procedures are in place, however, for those who qualify. It's not my purpose here to discuss who does and who does not qualify for a fee waiver for these services, but that information is available on the web sites. When should I start the initial eligibility check process? Many prospective college student-athletes do not begin the process until sometime during their senior year of high school. But, if you know as a high school junior that you want to compete in college sports at the NCAA DI, NCAA DII, or NAIA level, you should start the initial eligibility process sometime during your junior year of high school. 3.0 GPA or higher with 14 core courses completed by the end of the junior year. Those core courses must meet the following minimums: 3 years of English, 2 years of math, 2 years of science, two additional years of core courses in English, math, or science, plus five additional core courses (which may include foreign language). Having the early academic certification in place not only makes life easier for the college coach recruiting the athlete, but further indicates the individual possesses the kind of responsibility in taking care of business ahead of time that every college coach likes to see. If you're looking for an athletic scholarship, that is the right impression to make on your future college coach. Make every effort to get an early certification or determination of academic eligibility, and get it done before the beginning of your senior year. Note that you may not sign a National Letter of Intent for a college scholarship during your senior year of high school without early academic certification (NCAA) or early determination (NAIA). This will mean including the NCAA or NAIA (or both) recipients of your ACT or SAT test scores taken during your junior year. Neither eligibility center accepts ACT/SAT score reports solely from transcripts. 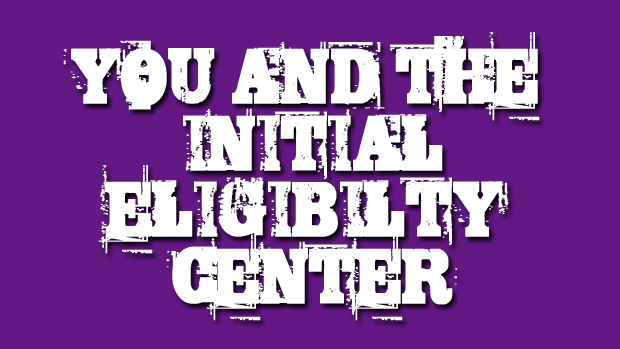 You must select the NCAA (code 9999) or NAIA (code 9876) initial eligibility center as recipients of your test scores directly from your testing agency. It also means going to your high school counseling center and ensuring that your coursework meets the eligibility requirements for the NCAA and/or NAIA and getting an official transcript sent to the eligibility center(s) at the end of your junior year. Please further note that you will still need to have final high school transcripts sent to either elibility center indicating you have completed the full complement of required core courses at the end of your senior year of high school. What is the full complement of requirements for initial eligibility? There is no initial eligibility certification for NCAA Division III schools. These schools are left to determine their own standards for athletic eligibility. Until and unless you have completed your initial eligibility registration, you are not ready to seriously begin the search for a college athletic scholarship. Begin here. Get the registration process out of the way first, during your junior year. Have your ACT/SAT scores reported to the eligibility center(s). Have transcripts sent to the eligibility center(s) at the end of your junior year. It's not that complicated; make sure you get it done.